My family likes chana dal in its various avatars like chana dal curry, urad chane ki dal, lauki chana dal etc. In West Bengal part of India, chana dal is known as cholar dal and cooked in a different way with coconut and all. Here I have cooked it with Punjabi tadka and addition of chana masala gives this dal, added flavour. 1. Wash and soak chana dal for 1 hour. Drain. 2. Place chana dal in a pressure cooker along with 3 cups of water, salt, ginger and turmeric powder. Pressure cook to 5 whistles and let the pressure drop down before opening the lid of the cooker. 3. For the tadka or tempering, heat ghee in a small pan and add cumin seeds. When they change colour, add hing. Add onion and green chillies. Sauté till onion turn light brown. Add chana masala powder and fry for 1 minute. 4. Add tomatoes and cook till tomatoes turn soft and pulpy. 5. Add this tadka to the dal and cover with a lid so that tadka seep through the dal. 6. Add garam masala and give 1 boil to the chana dal. Let the dal simmer on a low heat for 3-4 minutes. Turn off the heat and garnish chane ki dal with chopped coriander leaves. 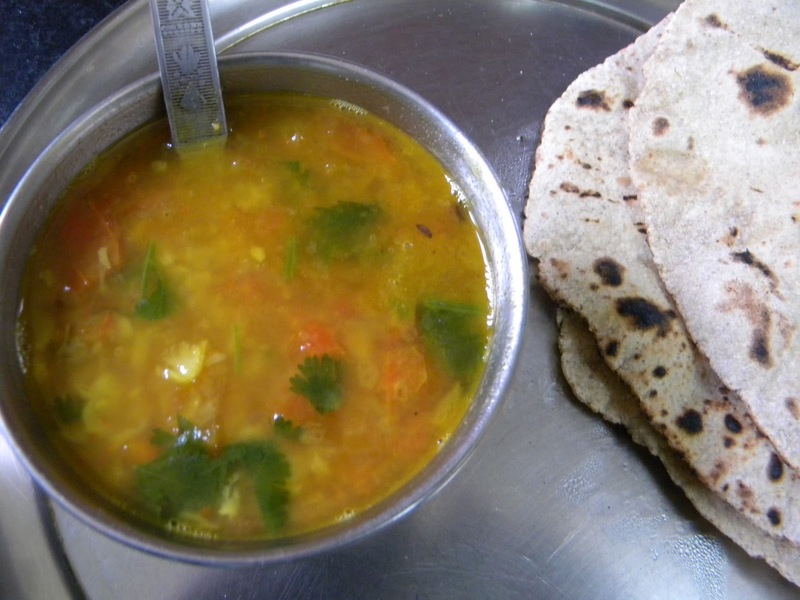 Chana dal tastes great with both rotis and rice.